The long hot Australian summer sees families hot-footing it across sandy beaches or diving in for fun at the pool. Whether you’re the pool type or the beach sort, you’ll want your kids to have great swimwear offering durability and protection. Karen Panaretto is the designer and owner of Tkxi Surf swimwear. After a decade working with swimwear giant Seafolly, this is one lady who knows all the ins and outs of bathers. 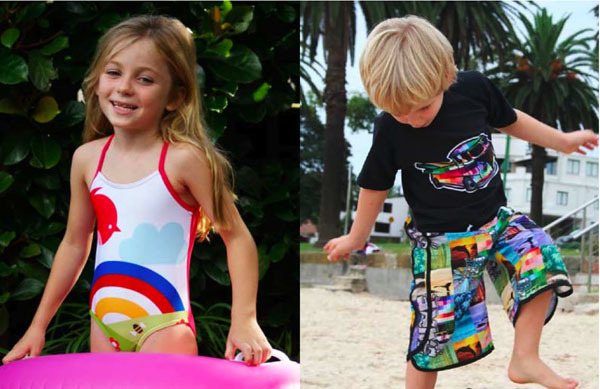 Tkxi Surf offers swimmers for infants, toddlers and big kids up to twelve years old. Tkxi Surf swimwear is unlike anything else you will see on the beach, so you’ll be able to spot your child amongst the crowds easily thanks to the bright colours, funky prints and gorgeous attention to detail. The fit is generously cut but there is no sign of saggy fit rashies and bottoms, making for a much more comfortable play. The Birdy Under The Rainbow range is so much fun, little girls will love showing off their togs. For smaller children the All-In-One Sunsuit is one of the best options, promising a whopping 97.5 per cent protection from harmful UV rays. The zip-up back allows for easy changes without having to wrangle something wet over the head (which always causes much fuss!). For boys there’s the coolest of Kombis, surfboards and tie dyed bats. Some rash vests, bikinis, boardies, and bottoms in both girls and boys ranges are sold separately so you can mix and match! Tkxi swimwear is an Australian product and priced from $33 at Tkxi Surf with delivery available.